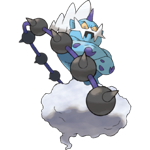 Thundurus is the six-hundred-and-forty-second Pokemon on the National Pokedex and was introduced in Generation 5 (Black and White and Black 2 and White 2). Thundurus is an Electric/Flying type Pokemon. It is a Basic Pokemon that does not evolve. Thundurus has two forms: Incarnate Forme and Therian Forme. It is a Legendary Pokemon in the Forces of Nature trio with Tornadus and Landorus.